Chromium round two is here thanks to 2018 Topps UFC Chrome! 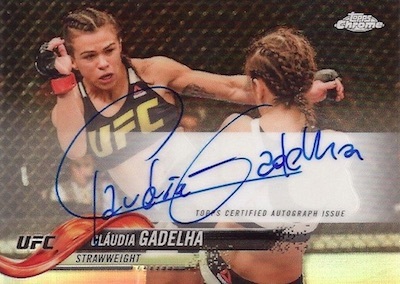 The MMA product again contains two autographs per box. The follow-up to the UFC Chrome debut in 2017, the 2018 set promises Hot Boxes that include either an exclusive autograph parallel as a third hit, or one exclusive base parallel per pack. Also worth noting, 2018 Topps UFC Chrome is only available in a Hobby format. Using the flagship baseball design, the Chrome UFC base set includes 100 fighters. Among the new faces, rookies are noted with the RC logo. Parallels start with Base Refractors at 1:3 packs. Other Refractor versions include X-Fractor (1:24 packs), Green (#/99), Blue Wave (#/75), Gold (#/50), Orange (#/25), Black (#/10), Red (#/5), SuperFractor (1/1) and Printing Plates (1/1). The Diamond parallels are only in Hot Boxes at a rate of one per pack. 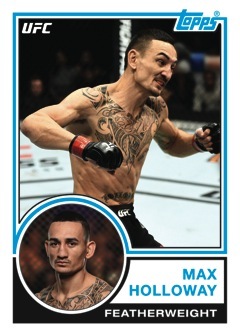 Continuing the homage to 1983 Topps Baseball across many Topps sets, the 1983 insert mixes 25 current and former UFC stars. Focusing on key octagon moments is Notable Knockouts (10 cards). Other 2018 Topps UFC Chrome sets showcase flashier takes on different brands, including Knockout Chrome (20 cards), Museum Collection Chrome (20 cards) and Tier 1 Chrome (15 cards). All inserts add Wave (#/99), Pulsar (#/50) and SuperFractor (1/1) parallels. 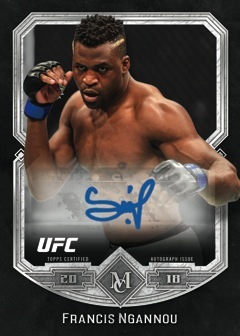 Presenting hard-signed cards for up 35 subjects, the main signature set in 2018 Topps UFC Chrome is found via Athlete Autographs. Refractor parallels add limited Green (#/99), Blue Wave (#/75), Gold (#/50), Orange (#/25), Black (#/10), Red (#/5) and SuperFractor (1/1) editions. There are also the Hot Box-only OctoFractor cards, which act as the third autograph in random boxes. 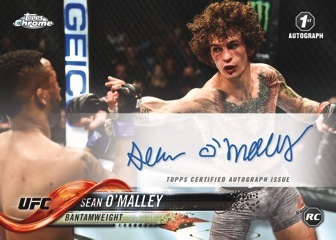 The short-printed Image Variation Autograph (#/10 or less) cards change the photo for select fighters. These come as a one-of-one SuperFractor, as well. There are also signed options for 1983, Knockout Chrome, Museum Collection Chrome and Tier 1 Chrome inserts. Each is capped at just five copies except for Knockout, which has a print run of 50. 2018 TOPPS UFC CHROME EDDIE ALVAREZ VARIATION ON CARD AUTO!!!! Buy 2018 UFC Chrome Hobby boxes direct from Topps for $78. REFRACTOR PARALLELS: Base Refractor (1:3 packs), X-Fractor (1:24 packs), Diamond (Hot Boxes), Green #/99, Blue Wave #/75, Gold #/50, Orange #/25, Black #/10, Red #/5, SuperFractor 1/1, Printing Plates 1/1. 10 cards. CMP Code on card back ends in #852. Shop 2018 Topps UFC Chrome autographs on eBay. REFRACTOR PARALLELS: OctoFractor (Hot Boxes), Green #/99, Blue Wave #/75, Gold #/50, Orange #/25, Black #/10, Red #/5, SuperFractor 1/1. 7 cards. Serial numbered #/10 or less. 16 cards. Serial numbered #/5. 13 cards. Serial numbered #/5. 12 cards. Serial numbered #/5. REFRACTOR PARALLELS: Wave #/99, Pulsar #/50, SuperFractor 1/1.